The most versatile Smart Luggage Tags in the world are here! When Dynotag® Smart Tags were first offered a couple years ago, they came in a single style: Laminated synthetic material in white. Once they became the best selling Smart Tags of their kind, we expanded our offerings to include a variety of new styles and sizes to meet our customers’ needs. And now, we are introducing another first: Convertible Luggage Tags! We call them “Convertible” because the same tag can be used in a variety of ways. They are ready to use as soon as you receive them after a simple activation! Or, you can insert your business card, logo or favorite photo to display on the “window” side of the tag. The back of the tag can still have the dynotag information – or you can flip that to expose a clean blank metal. We made then from tough aluminum in variety of eye-catching colors, so you can find one that will show well with your luggage, briefcase or bag. A tough, braided steel wire loop is included with each tag for secure attachment to your property. A drop of glue in the screw barrel makes the loop closure permanent! Now available in Ruby Red, Cool Silver, Emerald Green, Sapphire Blue, Electric Orange, and Midnight Black! New convertible tag selection from Dynotag! When it comes to battle-ready toughness, it is difficult to beat steel… So, again based on user input, we are also introducing two new “Fun Design” Deluxe Steel tags to join our best-selling Black Deluxe Steel Tag! Why not get some for your luggage and gear before you step out to your next destination? They also make a great travel gift for loved ones! Wishing you a wonderful Summer and safe travels! Leave a Dynotag Emergency Contact Info Tag with your Babysitter! How many things do you think about each time you walk out of the door and leave your child behind with the babysitter? Every bad situation races through your head. You wonder, “did I tell her that?” And you continue to ask that question of yourself throughout the evening out. You wonder what is happening, if you should be worried, and even if you chose the right person to stay with your child while you took a bit of time away or attended a function. One of the best ways to address these worries is using a simple and easy Dynotag ECI (Emergency Contact Info) Smart Tag. You could sit down and write down all of the information and details you want the babysitter to know. But then, that information becomes obsolete over time and needs to be rewritten over and over again. With Dynotag, though, the information can be kept up to date and easily accessible at all times. This simple tool allows your babysitter or any first responder to instantly have access to a great deal of information and resources all of which can help you to feel good knowing that your child is safe and protected even if you cannot be there to take care of him or her yourself. How to Use an ECI Dynotag? When you visit this tag in your web browser, you’ll see exactly what the first responders will see – and the owner will receive a notification of access, with view location when present. Since you can update it every time you leave or even add to it while you are on the road, there is no limit to how beneficial this tool can be. As you can see, there are many, many ways in which you can use Dynotag to communicate with your babysitter or anyone else you want to have the information, be it healthcare or law enforcement first responders. You can pick the right smart tag for your child so it is on their person at all times, ready for use. A variety of ready to use Emergency Contact Info tags area available for immediate delivery at the Dynotag store, ranging from charm bracelets, pendants to cards and even kids’ T-Shirts! After using one, you may yourself wondering how you lived without these Dynotag Smart Tags. Don’t let your kids and loved ones be without one! Dynotags are the perfect gift! Gifting a dynotag shows “You care!”. Whether it is a Luggage Tag to help them recover lost property or an Emergency Contact ID Card Set to show vital medical and personal information to First Responders, their dynotag will be there, working for them 7×24. Dynotags last for life, NO subscription required. Don’t you hate it when someone gives you a gift that requires a subscription? With personal dynotags there is NO subscription ever and recipients enjoy all the rich, industry leading features of their dynotag for life!. Dynotags are incredibly affordable and there are so many to choose from! We made dynotags very affordable, even though there is NO subscription required. Because dynotags are applicable to so many things in our connected, smartphone centered lives – we built dozens of products to address a variety of needs. Starting from less than $15 and going up to $100+ in attractively priced “gift bundles” – there is a dynotag that’s right for everyone on your list! No batteries to replace, ever! No “special” device requirements! Tough as nails! O.K. that’s three things right there – but the point is we build dynotags to be truly useful for the widest population around the planet. What good is a “Smart Tag” if it has a battery that needs tending? Just a matter of time before it would let you down! In contrast, dynotags have no batteries and anyone with access to a web browser on the planet can use a dynotag! No “special app” or “latest version of iPhone only” requirements – just a web browser. Also, thanks to the special materials we use in manufacturing, our tags are waterproof, UV proof and having no electronics to break – shockproof. They truly are the gift that keeps on giving. Satisfaction guaranteed! Our full selection is now available for immediate shipment to you and your loved ones at lightning speed. And if you are an Amazon Prime customer, all our products are in the Prime program – so they ship with free express delivery in two days!. New from Dynotag, just in time for Thanksgiving and the Holiday Season! We love hearing back from our users and are constantly inspired by your ideas and suggestions. Based on your feedback and requests, we have been busy developing new products, now available for immediate delivery via the Amazon Prime program! Our new ECI Charm Bracelet for ladies is extremely versatile thanks to its custom designed charms all of which are on lobster clasps – so they can be reconfigured in any combination and even transferred to an exiting favorite bracelet! To get you started, we include a loop chain bracelet that adjusts to virtually any wrist, ranging from grade school to college! Highly visible, functional and fun, while protecting the ones you love 7/24. Our unisex, one-size-fits-all ECI Wristband is designed for more demanding outdoor activities. Its secure velcro closure is adjustable from small wrists to full size wrists. The tough ECI information strip is kept in a secure pouch in the wristband and its clear, visible design calls the attention of first responders. Bicycling? Hiking? Climbing? this tough wristband can take it! NEW Property Recovery Tags: Gift bundles! You asked us to offer “bundles” of our category leading “Recovery Tags” – so we now offer bundled producs, attractively priced with sizable discounts compared to purchasing components individually. This makes sending an impressive gift pack easier than ever! This kit contains our most popular tags purchased by new dynotaggers. As an additional bonus, we include premium steel loops and snap hooks to help attach your new tags securely, right out of the package. With contents identical to the “Savvy Traveler Kit” but with a new, stylish “Camo” pattern, these tags are ready for any outdoor enthusiast to put them to good use. With these military themed tags, you also support a good cause: Dynotag will donate 25% of profits from this product to anA+ rated veterans charity to thank our heroes for their service! Perfect gift for a loved one – or yourself! A handsome white box containing an extensive selection of our recovery tags, and an ECI Card Kit, ready to fully deck the recipient out before travel! All these products are shipping now, with Amazon Prime 2-day delivery to you and your loved ones! 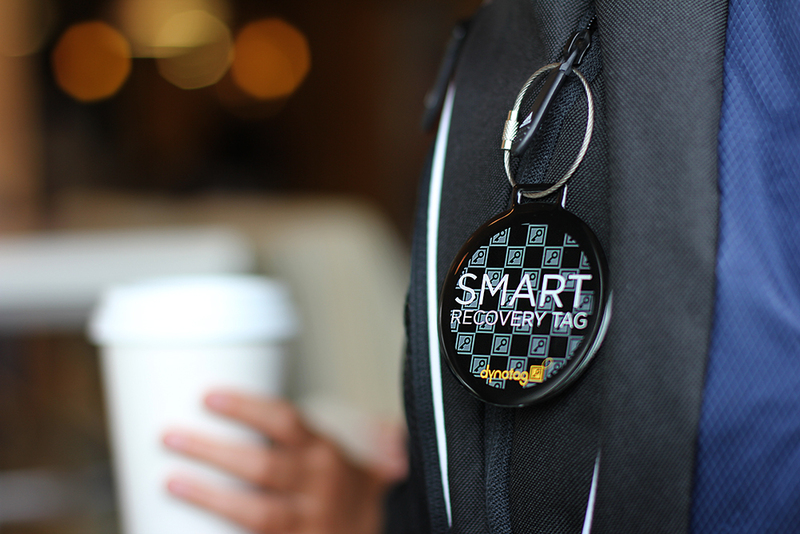 This School Year, be prepared and recover your stuff with Dynotag! As Summer memories fade, is it already time for the new school year. With all the anxiety, new classes, new schoolmates and all, we might as well start a race to see who loses the most things! This year, use the Dynotag technology you trust to get out of the lost stuff race and recover your stuff. Make it easy for teachers, office staff and your friends to quickly get in touch you when your stuff is found – thanks to the up-to-date recovery information in your dynotags attached to your belongings! Our popular Luggage Tags are on duty 7/24 on thousands of luggage items around the world. Our Micro ZIpper Tags are great for coats, sports equipment and small gear such as cameras, wristlets and chargers. Designed to be one-size-fits-all, these highly visible, easy to wear, velcro closure wristbands contain a tough, laminated special dynotag. You simply activate and load any information that would be valuable for First Responders. Easily adjusted to fit any wrist, be it a lumberjack or a grade schooler, they are sure to help your loved ones get proper assistance in their time of need. As always, all our consumer tags come full-featured with lifetime GOLD level Dynotag Cloud Service (DCS) subscription included, working for you 7/24 so you can use or gift them with confidence!